Countdown to the Final End or A Miscalculation? August 8th, 2009 12:30 AM | by William Bell | Day of the Lord, Dispensationalism. 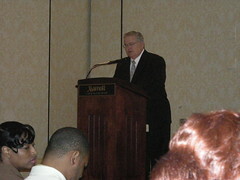 In his video posted at clipser.com, John Hagee lists 7 of his ten reasons the battle of Armageddon is imminent. In fact, two years ago, he said the coming of the Lord was so near that one could literally hear his footsteps shuffling along the clouds of heaven. Hmmm! Hold on, while I turn down my radio. Well, I’m not listening right now, and unless the FedEx plane flying over my house can be called a shuffle, I can’t hear it. Can you? Is it a Countdown to the Final End or a Miscalculation? Below are the seven reasons Hagee lists in the video as signs of the imminent end. Daniel prophesies that at the time of the end, knowledge shall be increased.This sounds pretty good on the surface. Especially when someone uses it to compare the secular, technical, and political knowledge of the 6th century B.C., with that of the world today. Is that prophecy or just plain old common sense? Could not anyone have foretold that common knowledge would increase. In fact, I can prophesy that 2600 years from today technology, science, mathematical, health, social and political knowledge etc will all advance beyond where it is today.What society has ever witnessed any different over time. If that is a sign of the end, it could have happened at any interval of past history.We suggest that two major errors in the “sign” above. First, Daniel speaks of the time of the end, not the end of time. His saw that time as days of the Messiah in the first century. When someone asked specifically “When Shall These Things Be,” the response was, “when the shattering of the power of the holy people comes to an end. This was a Bible question, and the answer given was a quotation from scripture, not a dissertation on the social, economic and technological advances in knowledge.The shattering of the power of the holy people takes up Moses‘ prophecy of Israel’s end in their last days. “For the Lord will judge His people and have compassion on His servants, When he sees that their power is gone, and there is none remaining bond or free. Moses prophesied that God would bring an end to Israel’s power by consummating the Old Covenant at their destruction in A.D. 70. This accords with Daniel’s “great tribulation” message cited by Christ in Matthew 24. All would occur within the first century generation. A careful study of Deuteronomy 32 with the New Testament provides ample evidence of the first century time frame. Daniel speaks not of secular knowledge, but of the knowledge of God in the New Covenant.Under the Old Covenant, Israel was first born into the covenant by natural birth. After they became of age, they were to be taught the knowledge of God. God promised to make a New Covenant with the House of Israel and Judah. In that covenant, they would no longer teach every man saying “know the Lord” but all would know him from the least to the greatest, Jeremiah 31:31-34. The reason for this is because in the New Covenant, God required that one be taught prior to entering the covenant, –unlike in Judaism per above.Jesus made clear that when the Holy Spirit was poured out, he would guide the apostles into all truth and would show them things to come, (John 16:13). This was the “more” knowledge that Israel did not have. Paul wrote that while under the Old Covenant veil, they saw as through a glass darkly. They knew in part, and prophesied in part. But when the perfect came, that which was in part was done away.In the very passages which mentions the time of the end, Christ taught that the gospel would be published as a witness in all the world to all the nations before the end of the Jewish age arrived. That end came before the generation then living passed away in A.D. 70. There has not been one Divinely inspired book of additional revelation written since the destruction of Jerusalem, thereby confirming that the increase in knowledge is a first century pre A.D. 70 event. The gospel is the knowledge of God which increased and expanded as the parable of leaven hid in three measures of meal until it filled the whole earth, Matthew 13:33, –in direct fulfillment of the prophecies, in Numbers 14:21; Isaiah 40:5; 52:10. Luke 3:6 show these texts were being fulfilled in the time of the ministry of John, the Baptist, in revealing the message of Christ. Also note Habakkuk 2:14 and Isaiah 11:9. See our discussion of Isaiah 11:9 and the time of it’s application. These texts are parallel and apply to the “mountain of God,” (Hebrews 12:22, 28; Galatians 4:26; Revelation 21:9, i.e. the kingdom as fulfilled in the New Testament. All Old Testament prophecy is fulfilled by A.D. 70, Luke 21:20-22. Take a deeper look at the fulfillment of these events bychecking out our book on Christ’s first century return. « What Does God Say About the Regathering of Israel?